Take it with you when you go. I mentioned yesterday that I have been doing some more decluttering in my garage. I had gathered, in one corner, a pile of stuff that belonged to my son. There was his battered old bicycle frame from his accident when he was nineteen, various bicycle parts, a pile of 24 used skateboard decks, a box with spray paint cans, a pile of used core-board for mounting photos from his university days, a sports bag (all shown in the photo below) along with a couple of small tables and a large sheet of chipboard ~ all out of shot. Some of my son’s stuff in the corner of the garage. He came over last week and together we went through the items and he decided what he wanted to keep and what I could donate or Freecycle. He has, for now, decided to keep the bent bike frame with ideas of either using it in an art project or displaying it as a reminder of his lucky escape from what could easily have been a debilitating brain injury. He kept the bicycle parts that belong to his replacement bike but allowed me to donate, to the local bicycle rescue project, the undamaged wheel, seat and handlebars from the damaged bike. He is also going to take the two tables and sheet of chipboard to use as work surfaces for artistic purposes in the future. He also kept the sports bag and the spray paint cans, but the core-board will be offered to the thrift store for merchandising purposes. Sixteen of the skateboard decks are awaiting pick-up with plenty of other Freecyclers happy to claim them if this round of claimers don’t turn up. 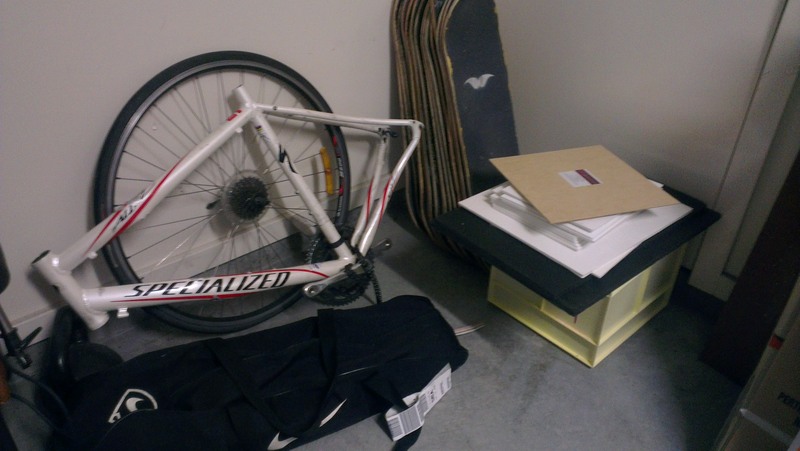 The bike parts have already been delivered to The Newcastle Bike Ecology Centre and all the things my son wanted to keep, bar the chipboard, has already been taken to his home. The core-board will be offered to the thrift shop this week (weather pending). Both my children have been very good about being responsible for taking all their stuff once they settled into their own homes. I guess I made it clear that leaving it behind wasn’t an option. Which proves that parents don’t have to hold on to their kids stuff forever. In fact I was talking to a friend of a friend last week who gave her son a ultimatum of pick up your stuff or I’m getting rid of it. She wasn’t popular at first but he got over it and she is no longer housing his clutter. Reassess and possibly declutter a little more stuff from a storage space in your home. I have been working on my garage again, which is my launching place for everything that leaves my home. This time around I have been focused on clearing it of items that belong to my son, who has left home. 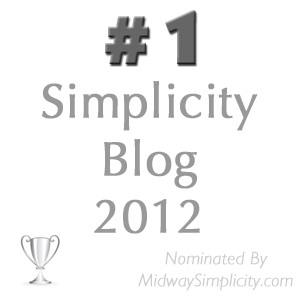 We achieved a lot in that area this week which I will tell you more about in a post tomorrow. Colleen, it’s good that your kids are willing to take their stuff or get rid of it. I know so many parents who are still storing things for their kids who have been out of the house for years and years. If you have your own house them get that stuff and bring it home. I think they leave it at their parents because then they don’t have to deal with it. Duh! If you don’t deal with it now you will when the parents pass on or have to go into assisted living or a nursing home. I sometimes wonder how much of the clutter in parent’s homes would be gone if their kids just came and got their own stuff? Also Deb, the question has to be asked, why do the parents put up with it and store the stuff for them. That is why I mentioned that friend of a friend who didn’t mess about but told her son, take or it’s gone. I kept stuff here for my daughter but only until she was actually settled into a proper home of her own. Had her situation continued on for much longer she wasn’t she would have received the same ultimatum. Like you I can understand keeping things when your kids are in and out of college or trying to find a place to land but to keep it for years and years is just something I don’t get. As much as Mom and Dad were keepers of stuff they didn’t keep mine or my brother’s. It was all theirs. Tammy says the music/guitar corner is looking good, but now I gotta see what I’ve left behind at my parents’ house this summer! We are flying though, so I may have to tell them to get rid of it all, unless it’s small and very valuable, which is extremely unlikely, especially in the latter case. Hi CJ, you make sure you do that. I am sure your parents will be grateful even if they are left with the task of getting rid of it. I don’t mind offloading my kids stuff once they give me the go ahead. Oh CJ, don’t even get me started on baseball cards. I have come to hate those things. If you typed baseball cards into my search bar you might find one or two or more tirades about baseball cards. I would like to say they have all left my house but sadly no they haven’t. You might wonder why as an Australian we have, or have had, so many baseball cards but we did live in America for seven and a half years. We are Seattle Mariners fans, sadly that hasn’t been very satisfying since 2001 but such is life. Cripes!!! I had no idea baseball cards were such an epidemic! I’ll call before we go to NY and just tell Ma and Pa to give ’em to the nephews or toss ’em. They don’t even fill a shoe box, but as we all know, junk adds up wicked fast. Your title made me smile, Colleen! I had stuff at my parents’ house for years after I was gone and married and had my own house. But no sooner did I take the last of it when my mother started asking if I wanted this or that from her own stuff she was trying to get rid of. With a huge house and not much in it, I kept saying yes … until about two years ago, which is when I decided to attack our clutter, and when I found your blog. Hi Jo H, I am glad you are feeling better about your clutter because you have the know-how to deal with it. When the kids begin leaving home they are usually in need of lots of stuff so this is a great opportunity to help them out and declutter at the same time. I admit I have been doing this with my kids. Not only are they taking their stuff but I am giving them some of mine. I only offer them the stuff I know they have already expressed a desire to take or have a use for. So many times they have asked ~ “If you want to get rid of (such and such) I will be happy to take it off your hands. Aside from some bits of furniture that we need to hire a van to deliver to them, I think we are about done with giving them stuff now though. My husband still has a fair amount of stuff at his mom and dad’s house. We did pick up two boxes worth of stuff two weeks ago when we were there. We will get the rest of it too, but thankfully they aren’t pushing us and since we’re planning on moving soon we appreciate their willingness to house it for a bit longer. I don’t think I have anything at my parents house. If I do, they haven’t told me about it. Everytime I decide to get rid of something that’s a bigger ticket item my mom has me mail it to her house so she does have some of ‘my’ stuff, but it’s stuff I decided I didn’t want anymore but she thought she or my sister could use so it’s theirs now. 🙂 These things include a train set, a sewing machine, a music box, and a few other items. Hi Melissa, I am glad you are at least showing signs of claiming your husbands stuff from his parents house. The fact that parents don’t push their kids to take stuff from doesn’t mean they don’t want it gone. This if often just another social convention, like exchanging gifts, that people often conform to whether they like it or not. I am sure your parents-in-law will be most grateful once you have moved and care clean the stuff out of their home. That being said some parents like to cling on to stuff of their children once they are gone. Best way to know the difference is to simply ask. Good for you Melissa. So often these conversations don’t take place because one side doesn’t want to know if their stuff is a burden and the other doesn’t want to rock the boat. I am glad you are open enough with each other to talk about it. Colleen, I think it’s great how you handle that. I know that also parents can rather insist on keeping stuff for their kids (“because you don’t have room in your apartment, and they don’t bother me at all here”) instead of just letting them deal with it and maybe get rid of it all, because they in fact don’t have room for it and it might be quite a good idea that they only keep as much as they actually have room for. I still have things at my parents’ houses, but none of it intentionally stored there, most is just “left behind”. It’s not much anymore, because I am getting rid of some of it and take along some of it every time I’m there, but it will still take a little longer, I think. I agree Sanna, that it comes to a point, if someone has been away from home for a long time and their living arrangements aren’t likely to change, then they need to get rid of the stuff, at their parents home, that isn’t fitting in with their lifestyle. I am glad that you are at least slowly removing your stuff from your parents house. I agree. It’s actually not that easy to declutter there for me as I often visit on holidays and without a car. So many donation places there are closed and I can’t carry that much along with me. However, I’m mostly done now, I think. As for a skateboard deck art project, I remember seeing wall shelves made from skate boards and thought that was an awesome idea for a boy’s room or trendy retail shop. I always thought the shelving idea would be good too but a bit hard to get away with when you are renting. Hence it never happened and still can’t at his home. My husband is in the military so we get cheap rent, we own a house but haven’t ever lived in it. It is an investment property and it wasn’t the first. Different lifestyles call for different choices. 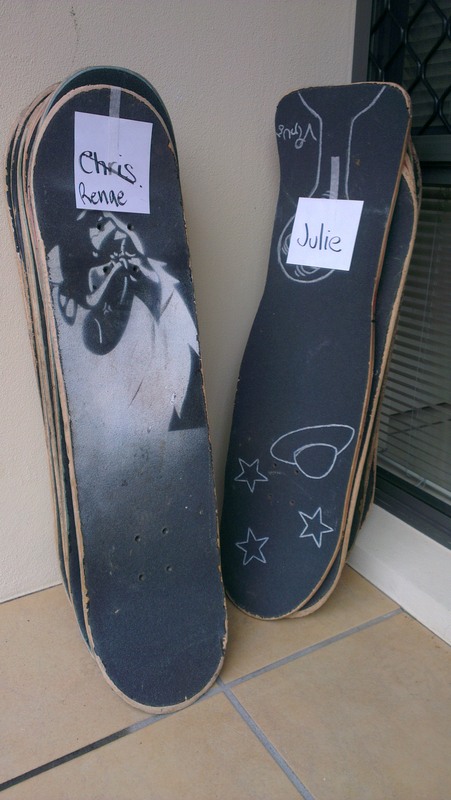 Colleen – I can vouch that giving up old skate decks is MONUMENTAL! There is a similar number stashed in my son’s room, even the broken ones have been pieced back together in their place in the stack. He’s not a materialistic person at all, but is territorial about these, so as long as they stay under his bed or in the wardrobe I’m ok with them staying as long as he does. The thing I love about Freecycle, is the small stories people tell you about why they want the item or what they intend to do with it. For me it makes it easier to let the item go. I pick one of those people over the others everytime. Hi Moni, I knew you would understand. And I also agree it is easier to give things away to people who have a good story as to why they want the item in question. Freecycle is good for this. Your post today reminded me of my toys that my parents had stored of mine. This was twenty years ago when they too moved house and I was about 3o. They had been stored for so long I must have been three or four when I played with them and had no recollection of them at all! There was a ‘Dad made’ dolls cradle, made with the metal slats of an old Venetian blind. Most of our toys were Dad made when we were young. Yesterday I visited a friend whose Mum had passed away before Christmas , she had some items from her childhood that her Mum had kept. Her school work book when she was 8, a ballet costume that her Mum had made her 50 years ago and a jumper her Mum had knitted for her son twenty years ago. Samples of a life now gone. Some people find it hard to let go of the past and surround themselves with reminders of such a life. I am trying to focus on the future and look forward to the good times. Hi Wendy, keeping one of two things is one thing keeping an attic full is quite another situation. I have found that I have a pillow case in my camphor wood chest filled with items from when Bridget was a baby. I think I need to ask her if she wants any of it and what she doesn’t can probably go. They are all handmade items either I or the grandmothers made for her and or Liam. I know people who are storing stuff for their kids and I think that their kids really don’t remember even half of what may be in the collection. Definitely better to purge as much as possible as they outgrow things so that this is not a burdensome task once they move out. Hi Jen I agree, now that Liam has moved out it is plain to him that there is only so much room in a house. Which is why he is letting his stuff go. Ha! Sometimes I think when my mother declutters she just brings it to my house. The number of boxes of things that are apparently mine that turn up is astonishing! Thus far I have managed to prevent her clutter moving into my house and I think it is selective memory rather than intentional but there is always a frisson of anticipation when they arrive and we count the boxes coming out of the boot of the car. Where the problem arises is when she has kept something of mine because she wanted to and now presents it to me as my problem. Our local hospice shop has done very well out of that. I would like to point out that as I am almost 50 there is precious little of my stuff, if any, left at my mother’s house! Hanging my head in shame and admitting my guilt over leaving stuff at my parents’ home for decades. When we first moved to the US from the UK we didn’t know how long we’d be here so left a lot of things in their house – at least it was mostly organized in a corner of their attic. Twenty-five years later we have either given away the stuff or brought it here in small amounts each time we went over there, but it did take a long time and even though they never seemed to mind I can now well imagine that they would much have preferred for it to be gone. I know I won’t have the same kind of patience with my sons. I appreciate your honesty Christine. My husband and I left stuff in storage in Australia when we went to live in the US and it was seven and a half years before we came back to Australia so I understand why you left your stuff behind. We only expected to be gone two to three years and we weren’t paying the costs of the storage, my husband employers were. There was a lot of stuff we would have offloaded before we left had we known we would be gone for so long. Great! Only I divorced parents in two different states and neither owned a home. Oh, I loathe my typos! Sorry! I wanted to add that I felt very responsible for my own stuff. My mother has a hoard of her own to deal with!